Cities: Capital: Bangui (pop. 701,597). Other cities — Kaga Bandoro (68,000 est.) Berberati (56,867), Bouar (39,676), Bambari (32,603), Bangassou (24,450), Bossangoa (31,723), Mbaiki (16,901), and Carnot (31,324). Nationality: Noun and adjective — Central African(s). Population density (2010 est. ): 7.07 people per square km. Annual population growth rate (2010 est. ): 1.9%. Ethnic groups: More than 80; Baya 33%, Banda 27%, Sara 10%, Mandjia 13%, Mboum 7%, M'baka 4%, Yakoma 4%, other 2%. Religions: Protestant 25%, Roman Catholic 25%, Islam 15%, indigenous beliefs 35%. Languages: French (official), Sango (national). Education: Years compulsory: from ages 6-15. Enrollment (2010 est., gross enrollment) — primary school 93%; secondary school 13%. Literacy (2010 est.) — 55.2%. Health: Infant mortality rate (2010 est.) — 106 deaths/1,000. Life expectancy (2009 est.) — 46.88 years. HIV prevalence rate (2009 est., ages 15-49) — 4.7%. Work force (approx. 73% of population ages 15 and over): By occupation — agriculture 75%; industry 6%; services and government 19%. Telecommunications (2009 estimates): 4.1 phones per 100 people; 0.5 Internet users per 100 people. Branches: Executive: president, prime minister, and Council of Ministers. Legislative — unicameral National Assembly. Judicial — Constitutional Court, inferior courts, criminal courts, Court of Appeals. Political parties: More than 40, including Kwa Na Kwa (KNK), Alliance for Democracy and Progress (ADP), Party for a New Central Africa (PNCN), Central African Democratic Assembly (RDC), Civic Forum (FC), Democratic Forum (FODEM), Liberal Democratic Party (PLD), Movement for Democracy and Development (MDD), Movement for the Liberation of the Central African People (MLPC), Patriotic Front for Progress (FPP), People's Union for the Republic (UPR), National Unity Party (PUN), Central African Democratic Party (PDCA), Republican Convention for Social Progress (CRPS), New Alliance for Progress (NAP), and Social Democratic Party (PSD). GDP (2010 est., current U.S. dollars): $2.013 billion. Annual real GDP growth rate (2010 est. ): 3.3%. GDP per capita (2010 est., current U.S. dollars): $457. GNI per capita (PPP): $790. Avg. inflation rate: (2010 est., consumer prices): 1.5%. Natural resources: Diamonds, uranium, timber, gold, oil, coffee. Agriculture (2009, 56% of GDP): Products — mostly food crops, livestock, and timber, with some cotton, coffee, and tobacco. Arable land — 3.1%. Industry (2009, 15% of GDP): Types: diamond mining, sawmills, breweries, textiles, footwear, assembly of bicycles and motorcycles, and soap. Services (2009): 29% of GDP. Trade (2009): Exports: $290 million; timber and diamonds, with some exports of coffee, cotton, and tobacco. Major markets — Belgium, China, France, Germany, and Saudi Arabia. Imports — $449 million; petroleum products, milling industry products, pharmaceuticals, and machinery. Major suppliers — France, United States, Cameroon, Netherlands, China. Central government budget (2009): $431.03 million. Defense (2009): 1.8% of GDP. There are more than 80 ethnic groups in the Central African Republic (C.A.R. ), each with its own language. Sango, the language of a small group along the Oubangui River, is the national language spoken by the majority of Central Africans. Only a small part of the population has more than an elementary knowledge of French, the official language. Approximately 61% of the population of the C.A.R. lives in rural areas. The chief agricultural areas are around Bossangoa, Bouar, and Bambari. Bangui, Berberati, Bangassou, and Bossangoa are the most densely populated urban centers. The C.A.R. appears to have been settled from at least the 7th century on by overlapping empires, including the Kanem-Bornou, Ouaddai, Baguirmi, and Dafour groups based in Lake Chad and the Upper Nile. Later, various sultanates claimed present-day C.A.R., using the entire Oubangui region as a slave reservoir, from which slaves were traded north across the Sahara and to West Africa for export by European traders. Population migration in the 18th and 19th centuries brought new migrants into the area, including the Zande, Banda, and M'Baka-Mandjia. Following riots in Bangui and the murder of between 50 and 200 schoolchildren, former President Dacko led a successful French-backed coup against Bokassa on September 20, 1979. Dacko's efforts to promote economic and political reforms proved ineffectual, and on September 1, 1981, he in turn was overthrown in a bloodless coup by Gen. Andre Kolingba. For 4 years, Kolingba led the country as head of the Military Committee for National Recovery (CRMN). In 1985 the CRMN was dissolved, and Kolingba named a new cabinet with increased civilian participation, signaling the start of a return to civilian rule. The process of democratization quickened in 1986 with the creation of a new political party, the Rassemblement Democratique Centrafricain (RDC), and the drafting of a new constitution that subsequently was ratified in a national referendum. General Kolingba was sworn in as constitutional President on November 29, 1986. The constitution established a National Assembly made up of 52 elected deputies, elected in July 1987. Due to mounting political pressure, in 1991 President Kolingba announced the creation of a national commission to rewrite the constitution to provide for a multi-party system. Multi-party presidential elections were conducted in 1992 but were later cancelled due to serious logistical and other irregularities. Ange Felix Patasse won a second-round victory in rescheduled elections held in October 1993, and was re-elected for another 6-year term in September 1999. In October 2002, former Army Chief of Staff Francois Bozize launched a coup attempt that culminated in the March 15, 2003 overthrow of President Patasse and the takeover of the capital. General Bozize declared himself President, suspended the constitution, and dissolved the National Assembly. Since seizing power, President Francois Bozize has made significant progress in restoring order to Bangui and parts of the country, and professed a desire to promote national reconciliation, strengthen the economy, and improve the human rights situation. A new constitution was passed by referendum in December 2004. In spring 2005, the country held its first elections since the March 2003 coup. The first round of presidential and legislative elections were held in March 2005, and in May, President Bozize defeated former Prime Minister Martin Ziguele in a second-round runoff. On June 13, Bozize named Elie Dote, an agricultural engineer who had worked at the African Development Bank, his new Prime Minister. Following a countrywide strike, Elie Dote resigned on January 18, 2008. In September 2006, rebel activity in the northwestern and northeastern part of the country intensified, resulting in the government losing control over parts of its territory. The subsequent fighting between government troops and rebels displaced nearly 300,000 citizens. In January 2007, the Libyan Government brokered a peace agreement between the government and the Democratic Front of the Central African People (FPDC), a rebel group operating in the northeastern part of the country headed by Abdoulaye Miskine. Other rebels disavowed the peace agreement, but by May 2008, most rebel groups had either entered into a peace agreement with the government — the peace agreement with the Popular Army for the Restoration of Democracy (APRD) being the most significant — or declared a cease-fire. In June 2008, the government signed the Libreville Comprehensive Peace Agreement with the APRD and the Union of Democratic Forces for Unity (UFDR), led by Zakaria Damane, in Libreville, Gabon. One rebel group, the Convention of Patriots for Justice and Peace (CPJP) remained outside of the comprehensive peace process. The CPJP attacked the Central African Army on numerous occasions, including in November 2010 when they briefly captured the town of Birao. In June 2011, the government signed a cease-fire agreement with CPJP. Since that time, the government and CPJP have not fought; however, the CPJP engaged in skirmishes with UFDR in the northeastern region of C.A.R. in September 2011. CPJP and UFDR signed a cease-fire agreement in October 2011. In January 2009, a new coalition government was appointed. While there was little change in the government's composition, with key ministers allied with the President remaining in place, some members of the political opposition and rebel groups obtained ministerial portfolios. In early 2010, President Bozize twice delayed constitutionally mandated elections scheduled for April and May due to a poorly functioning Independent Electoral Commission (IEC) and bickering between C.A.R. 's political parties. The first round of presidential and parliamentary elections took place in January 2011. The elections, though not without flaws, were held peacefully and without major incident during polling. The IEC declared President Bozize the winner of the presidential election in the first round and determined that a third of the 105 parliamentary races were also decided in this round. Nine members of President Bozize's family, also members of his KNK party, won victory in the first round. The National Assembly is made up of 105 members elected by popular vote to serve 5-year terms. Legislative elections were last held in 2011. 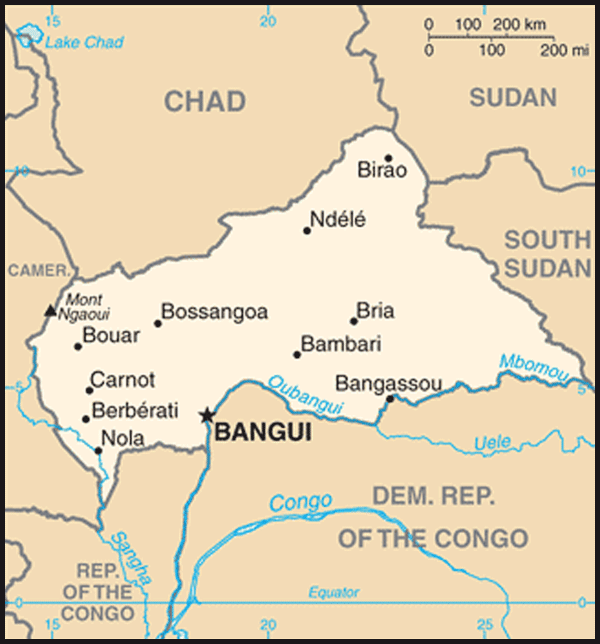 For administrative purposes, the country is divided into 16 prefectures that are further divided into over 60 subprefectures; the commune of Bangui is administered separately. The president currently appoints heads of these administrative units, called "prefets" and "sous-prefets". There are 174 communes, each headed by a mayor and council appointed by the president. Suffrage is universal over the age of 18. The Central African Republic has a very weak civil society, with its various actors struggling for funding and sustainability in an impoverished country. The Central African Republic maintains an embassy in the United States at 2704 Ontario Road, NW, Washington, DC, 20009 (tel: 202-483-7800/01, fax: 202-332-9893). The Central African Republic is classified as one of the world's least developed countries, with an estimated 2010 per capita GDP of $457. Sparsely populated and landlocked, the nation is overwhelmingly agrarian, with the vast bulk of the population engaged in subsistence farming; 56% of the country's gross domestic product (GDP) came from agriculture (including timber) in 2009. Principal crops include cotton, food crops (cassava, yams, bananas, maize), coffee, and tobacco. From 2002 to 2007, timber accounted for an average of 48% of export receipts. More than 4,000 Central Africans work in the forestry sector, more than in any other private sector. The country also has rich but largely unexploited natural resources in the form of diamonds, gold, uranium, and other minerals. There may be oil deposits along the country's northern border with Chad. Diamonds are the only of these mineral resources currently being developed; in 2002, diamond exports made up close to 50% of the C.A.R. 's export earnings. Industry contributed only about 15% of the country's GDP in 2009, with artisanal diamond mining, breweries, and sawmills making up the bulk of the sector. Services accounted for about 29% of GDP in 2009, largely because of the oversized government bureaucracy and high transportation costs arising from the country's landlocked position. Hydroelectric plants based in Boali provide much of the Bangui's limited electrical supply, with towns in the rest of the country relying on diesel generators to provide electricity. Fuel supplies must be barged in via the Ubangui River or trucked overland through Cameroon, resulting in frequent shortages of gasoline, diesel, and jet fuel. The C.A.R. 's transportation and communication network is limited. The country has just over 700 kilometers of paved road, limited international and no domestic air service (except charters), and does not possess a railroad. Commercial traffic on the Ubangui River is impossible from December to May or June, and conflict in the region has sometimes prevented shipments from moving between Kinshasa and Bangui. The telephone system functions, albeit imperfectly. Eighteen radio stations currently operate in the C.A.R., as well as one television station. Numerous newspapers and pamphlets are published on a regular basis, and at least one company has begun providing Internet service. In the more than 40 years since independence, the C.A.R. has made slow progress toward economic development. Economic mismanagement, poor infrastructure, a limited tax base, scarce private investment, and adverse external conditions have led to deficits in both its budget and external trade. The country saw a 30-year decline in per capita gross national product (GNP), and its debt burden is considerable. Structural adjustment programs with the World Bank and International Monetary Fund (IMF) and interest-free credits to support investments in the agriculture, livestock, and transportation sectors have had limited impact. The World Bank and IMF are now encouraging the government to concentrate exclusively on implementing much-needed economic reforms to jumpstart the economy and defining its fundamental priorities with the aim of alleviating poverty. As a result, many of the state-owned business entities have been privatized and limited efforts have been made to standardize and simplify labor and investment codes and to address problems of corruption. The IMF recognized the C.A.R. 's achievements in these domains by certifying its attainment of the Heavily Indebted Poor Countries (HIPC) completion point in 2009. The C.A.R. Government has adopted the Central African Economic and Monetary Community (CEMAC - Communaute Economique et Monetaire de l'Afrique Centrale) Charter of Investment, and is in the process of adopting a new labor code. Under military restructuring plans formulated 1999-2000, the civilian Minister of Defense controlled and directed all armed forces, including the Presidential Security Unit (UPS), which had previously been seen as a militia supporting the president. This distinction has become somewhat blurred in recent years, as President Bozize holds the title of Minister of Defense and President and his son, Jean Francis Bozize, is the Deputy Minister of Defense. As of August 2009, the C.A.R. armed forces numbered about 7,000, including army, navy, air force, gendarmerie, national police, Presidential Guard, and local police personnel. Following the 2003 coup, CEMAC and C.A.R. armed forces assumed responsibility for securing the capital city. The Economic Community of Central African States (known by its French acronym, CEEAC) took over the CEMAC forces in 2008 and established the Mission for the Consolidation of Peace in the Central African Republic (MICOPAX). MICOPAX forces currently total approximately 500 soldiers and are supported by an additional 250 French soldiers. Military cooperation and training programs exist between the C.A.R. armed forces and France, South Africa, Greece, China, Morocco, and other nations. In 2007, the United Nations and the European Union authorized the deployment of a multidimensional security and police presence in eastern Chad and northeastern C.A.R. with a civilian and humanitarian protection mandate. The UN component of the mission (MINURCAT) consisted of police deployed to Chad only and a multi-dimensional liaison office deployed in Chad and C.A.R. The Security Council's resolution 1861 — which authorized the deployment of a military component of MINURCAT to follow up a European Union Force (EUFOR) in both Chad and the Central African Republic — extended MINURCAT's mandate for a period of 12 months beyond its March 2009 expiration. The UN took over EUFOR's military role in the region on March 15, 2009. MINURCAT was authorized to establish a presence in Birao in northeastern Central African Republic to create a more secure environment, protect civilians and humanitarian workers in danger; and to protect United Nations personnel, facilities, installations and equipment and to ensure the security and freedom of movement of its staff and United Nations and associated personnel. At the behest of the Chadian Government, MINURCAT departed Chad, and as a result the C.A.R., in late 2010. In February 2008, elements of the Lord's Resistance Army entered the C.A.R. Since that time, LRA elements have attacked and abducted thousands of Central Africans. In the summer of the 2009, the Ugandan national army, known as the Ugandan People's Defense Force or UPDF, began operations to pursue the LRA and to help protect local populations. In October 2011, President Barack Obama announced that the United States would deploy a small number of U.S. forces to act as advisors to the national militaries in the region, including the UPDF and the Central African Armed Forces (FACA), that are pursuing the LRA. Forces were deployed to C.A.R. in December 2011. The Central African Republic is an active member in several Central African organizations, including the Central African Economic and Monetary Community (CEMAC), the Economic Community of Central African States (CEEAC), and the Central Bank of Central African States (BEAC). Standardization of tax, customs, and security arrangements between the Central African states is a major foreign policy objective of the C.A.R. Government. The C.A.R. is a participant in the Community of Sahel-Saharan States (CEN-SAD) and the African Union. China, Libya, and, to a lesser degree, Turkey and Sudan have shown increased interest in cooperation with the C.A.R. over the last years. Outside of Africa, the C.A.R. maintains fairly close ties to France, albeit considerably reduced from previous years. In the late 1990s, France withdrew the majority of forces stationed in the C.A.R. ; drops in its external assistance budget have reduced French military and social development aid to the country. Other multilateral organizations — including the World Bank, International Monetary Fund, UN agencies, European Union, and the African Development Bank — and bilateral donors — including Germany, Japan, the European Union, China, and the United States — are significant development partners for the C.A.R. Fourteen countries have resident diplomatic representatives in Bangui, and the C.A.R. maintains approximately the same number of missions abroad. Approximately double this number of countries have honorary consuls present in Bangui. Many large countries cover the C.A.R. from neighboring states like Chad, Cameroon, or the Democratic Republic of the Congo. Since early 1989 the government recognizes both Israel and the Palestinian state. The C.A.R. also maintains diplomatic relations with China. The C.A.R. generally joins other African and developing country states in consensus positions on major policy issues. The Embassy reopened in January 2005 and a resident Ambassador was appointed in June 2007; however, there currently is limited U.S. diplomatic/consular representation in the C.A.R. As a result, the ability of the Embassy to provide services to American citizens remains extremely limited. Restrictions on U.S. aid that were imposed after the 2003 military coup were lifted in 2005. In international fora, the United States has supported the mandates of the UN Integrated Peacebuilding Office in the Central African Republic (BINUCA; formerly the UN Peace-building Office in the Central African Republic — BONUCA) and of the Mission for the Consolidation of Peace in the Central African Republic (MICOPAX) in order to promote stability in C.A.R. Both BINUCA and MICOPAX, while constrained by their small sizes and budgets, have contributed to the pursuit of peace in C.A.R. The U.S. also supports the IPD process, in hopes that the C.A.R. Government, the political opposition, and the armed opposition will be better able to reach peace and move toward security in the countryside and in Bangui. The U.S. Embassy (http://bangui.usembassy.gov/) in Bangui is located on Blvd David Dacko, Bangui (tel: 236-61-02-00, fax: 61-44-94, B.P. 924, Bangui).